Nidhi Khosla’s research found that HIV agencies believed efforts to address HIV should go beyond prevention, treatment and care, and should include efforts to improve public safety and civic amenities, such as education and trust. COLUMBIA, Mo. – Agencies that serve people with HIV in the U.S. are at the forefront of delivering medical care, shelter, psycho-social counseling and other services to their vulnerable clients. These services are offered through a mix of different types of agencies, including local health departments, state government agencies, non-profits and faith-based organizations. Collaboration among these various entities is essential for holistically serving the needs of their clients. Now, a University of Missouri researcher has published two studies after studying collaboration among these types of agencies in Baltimore, a severely HIV-affected city. Her research offers suggestions for improving HIV prevention, treatment and care and provides an innovation in measuring collaboration among agencies. The study, “Perspectives of HIV agencies on improving HIV prevention, treatment and care services in the USA,” was published in AIDS Care and was co-authored by Iris Zachary, assistant research professor of health informatics at MU. Khosla’s other study combined two distinct methods to measure inter-agency collaboration — social network theory and relational coordination — in an effort to capture the depth and breadth of relationships among HIV agencies. This innovation allowed the researchers to capture different aspects of collaboration among agencies that cannot be explained by one method alone. “Understanding the breadth and depth of the relationships allows us to better understand inter-agency collaboration.” Jill Anne Marsteller, co-author of the study, said. This allowed for a better understanding of the strong and weak points of inter-agency collaboration and identifying policies to further enhance collaboration. For example, lower scores for frequency of communication can be addressed through virtual meetings and problem-solving sessions at regular meetings that are convened by the local health department. David Elliott, doctoral student in the department of sociology at MU, along with Marsteller and Yea Jen Hsu with Johns Hopkins Bloomberg School of Public Health, co-authored the study, “Analyzing collaborating among HIV agencies through combining network theory and relational coordination.” It was published in Social Science and Medicine. Both studies are drawn from research supported by the Distinguished Doctoral Research award received by Khosla, from the department of health, behavior and society of the Johns Hopkins Bloomberg School of Public Health. 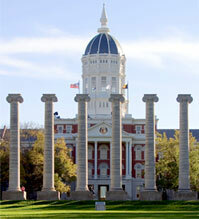 The MU School of Health Professions is the University of Missouri system’s only school of health professions and the state’s only such program located on a health sciences campus and part of an academic health system. Health professions account for more than 60 percent of the total U.S. health care workforce and represent more than half of the fastest growing occupations in the country according to the Bureau for Labor Statistics. With programs in rehabilitation, diagnostic and imaging sciences, graduates of the School of Health Professions fill critical roles in health care.